January was a great start to the year. The Gasparilla Day Parade was particularly festive, celebrated with the Krewe of Pandora on their float. Thanks for the great time ladies! As mentioned, we are moving into some new parts of town this year. Look for us at "Channelside Market" on Sun Feb 21st and at "Monday Night Moonlight Market" in Seminole Height on Mon Feb 29th. Stop by Locale Market at Sundial in St Pete for an in-store demo on Sat Feb 27th. You will be amazed by this beautiful market and restaurant. More new events next month. 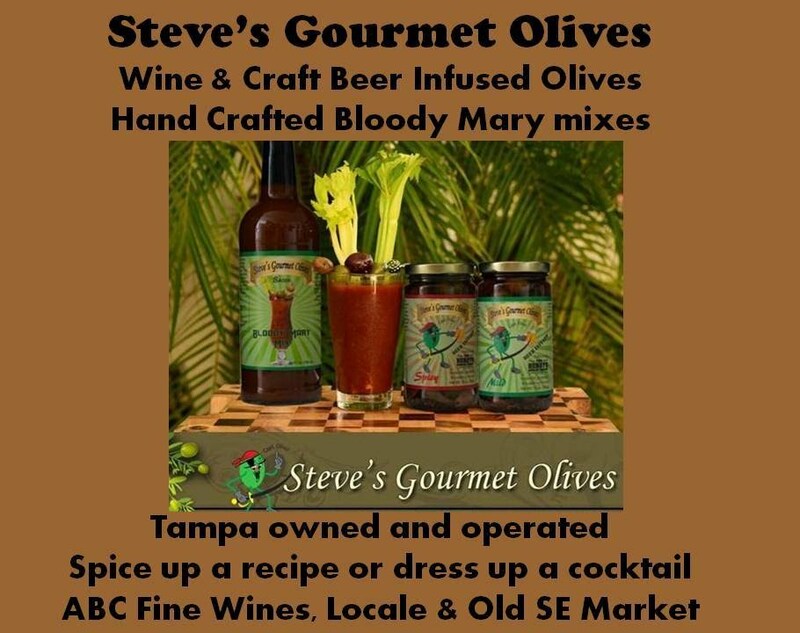 Bloody Marys were flowing at the Gasparilla Day parade on January 30th featuring Steve's Gourmet Olives mixes and St Petersburg Distillery's Old Banyan Vodka. Thank you Krewe of Pandora for featuring our products on your float and at the President's Brunch at Moxies Cafe. KOP President Susan Butler and husband Tim Butler with Steve, aka Captain Olive, at KOP President's Brunch at Moxies Cafe. Bloody Marys with all the fixings, in both Mild Bacon & Spicy Chipotle, were enjoyed by many beautiful Krewe of Pandora goddesses. Cheers! Did you know that there is a new distillery in right across the bay? St Petersburg Distillery is located near downtown St Pete . They create 9 craft spirits, including a delicious Banyan Reserve Vodka, and offer several styles of designer t-shirts too. From their website "Our community celebrates the creative spirit, and we're proud to count ourselves among the St Pete artisans and businesses building a vibrant city." We will be hosting some events with St Petersburg Distillery in the future. Keep up with these event via our Facebook page. Have a great February. Make sure to follow us on Facebook or Instagram for the latest news and events.